For a 1-page version of this recipe, see my: Chicken Pad Thai Recipe, OR for an easier version, see: Easy Chicken Pad Thai Recipe. Step 1: Warm a pot of water on the stove until just before boiling. Remove from heat and immerse rice noodles. Allow to sit while you prepare the other ingredients. Here is a very quick Asian-style marinade for meat which you can use with any stir-fry. Place 2-3 Tbsp. soy sauce in a cup (use 3 Tbsp. for 1 1/2 cups sliced chicken, or 2 Tbsp. for 1 cup chicken). Add 2 tsp. cornstarch and stir until the cornstarch dissolves. Now pour this mixture over the sliced chicken. Stir to combine. Allow the chicken to marinate in this mixture until ready to use. To make the Pad Thai sauce, start with the tamarind paste. Measure approx. 3/4 Tbsp. of this sticky black paste into a cup. Add 1/4 cup water and stir until the paste dissolves in the water (it helps if you use warm water). Now add 2 Tbsp. fish sauce, 1-3 tsp. or more red chili sauce, depending on how spicy you want it, and 2 1/2 to 3 Tbsp. brown sugar. Note: This may seem like a lot of sugar, but you need it to balance out the sourness of the tamarind paste. 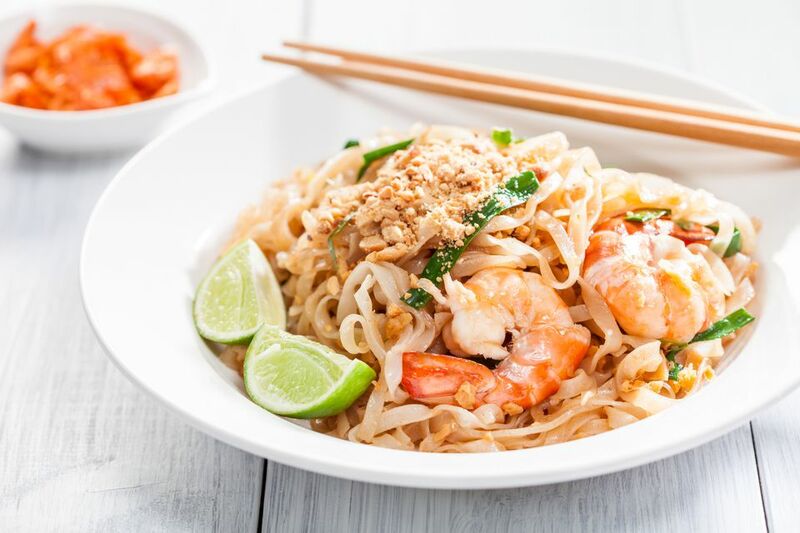 This balance is what makes Pad Thai taste so wonderful! If you're not sure how much sugar to use, taste-test the sauce - note that it will be very strong at this point (the taste will be "watered-down" when distributed over the noodles). Set sauce near the stove for use later. Prepare the Eggs (if using). I've made eggs optional in this recipe, as I find the chicken adds more than enough protein and flavor to the dish. However, since Thai chefs do add it to their Chicken Pad Thai, I also try to include it. Simply crack 2 eggs into a cup or bowl and stir enough to break the yolks. Set aside. Check the noodles by picking out a few strands with your fingers. The noodles should have turned from translucent ("see through") to opaque (pure white). The ones shown in the picture are nearly ready, but require about 5 more minutes. Another way to see if noodles are done soaking is to check the texture. They should be soft enough to eat, but still firm (firmer than "al dente"). Remember: the noodles still have to be fried, so don't over-soak them, or they will turn out "mushy" instead of chewy. I find about 20 minutes of soaking time is enough. Drain and run through with cold water to keep them from sticking. Reserve. Place a large (deep-sided) frying pan or wok over medium-high heat. When the wok/pan is hot, add 1-2 Tbsp. oil plus minced garlic (4 cloves). Stir-fry until fragrant (30 seconds to 1 minute). Add the chicken (together with the marinade). Stir-fry until the wok or pan becomes dry (30 seconds to 1 minute). Now begin adding some of the chicken stock. Add only a few Tbsp. at a time, enough to keep the chicken frying nicely. Keep stir-frying and adding stock until all the chicken stock (1/2 cup) is used up and chicken pieces/strips are cooked (about 5-8 minutes). Add the Egg (if using). If you're omitting the egg, go on to Step 8. Using a spatula or wooden spoon, push chicken to the outside of the wok or pan. Now add the egg, pouring it into the space you've made in the centre. Quickly stir-fry until egg is cooked (this part is like making scrambled eggs). Don't worry if some of the chicken gets mixed up with the egg - Pad Thai is a messy business, so this is just fine! Note: Some Thai chefs fry the egg in a separate frying pan, which is neater and also keeps your wok cleaner (egg tends to make the bottom of the wok/pan sticky). But it's an extra step I only perform when I have the time. Now add the noodles (over the chicken/egg). Pour the Pad Thai sauce over the noodles, trying to distribute it as evenly as possible. Using two spatulas, wooden spoons, or other utensils, quickly stir-fry the noodles. Use a "lift and turn" method (almost as though you were tossing a salad) instead of the usual stir-frying motion, or the noodles with break apart. After frying the noodles in this way for 1-2 minutes, add the bean sprouts plus about 1/4 tsp. freshly ground black pepper (sprinkle the black pepper over). Continue "tossing" for 1 more minute, or until noodles are done. When done, the noodles will taste soft but still chewy ("al dente") and a little sticky. At this point, you can add more fish sauce if you don't find the noodles salty enough (I usually add about 1 more Tbsp.). Note: Do not add any more liquid (other than fish or chili sauce) as you finish stir-frying, or your noodles will become "mushy". If your wok/frying pan is too dry, push noodles aside and add 1-2 Tbsp. oil, then continue cooking the noodles until done. Serve the Chicken Pad Thai Immediately! Delicious Chicken Pad Thai, topped with Peanuts, Coriander, and Lime. Copyright Darlene A. Schmidt, 10/07/10, About.com corp. Continuing to use your 2 utensils, lift noodles onto a serving plate. Top with generous amounts of fresh coriander, spring onion (green onion), and crushed or chopped nuts. cold lager (or a chilled glass of your favorite white/rose wine).